Immploy is a specialist recruitment agency supplying temporary and permanent medical staff to both government and private healthcare organisations across South Africa. We supply staff throughout the medical profession such as Medical Doctors, Nurses, Pharmacists, Radiographers, Optometrists, Dentists, Physiotherapists, Care Workers and all other Healthcare Professionals. Immploy is currently a preferred supplier of medical staff to both the Western Cape Department of Health as well as the City of Cape Town. 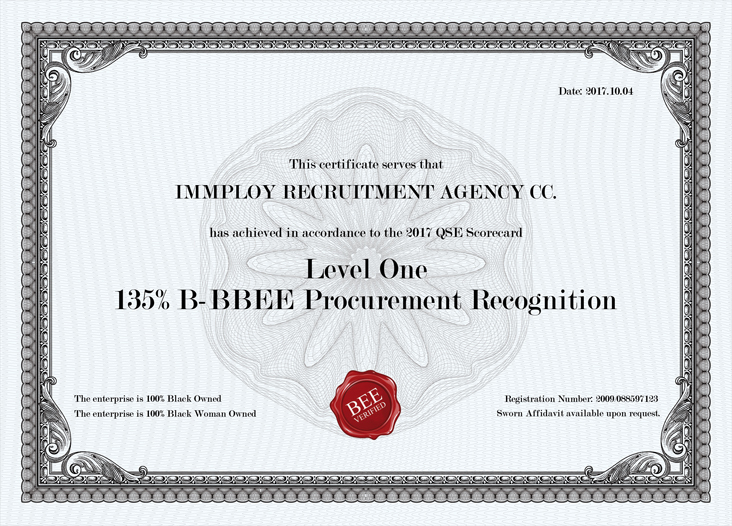 Immploy combines a number of dedicated medical recruitment divisions, providing complete recruitment, account management and outsourcing services to our clients. By developing expertise in multiple medical recruitment areas, Immploy is able to use expert knowledge and experience to assist its clients in finding the right candidate. Immploy is dedicated to reducing the time and overhead expense from your recruitment process by offering you a seamless and complete solution to all your medical staffing needs. Our “always available” service ensures that we can meet all your staffing needs 24 hours a day, 7 days a week.